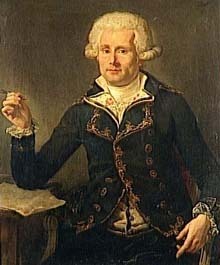 Charles Messier was a French astronomer famed for his list of more than 100 bright deep-sky objects, now known to be a variety of nebulae, star clusters, and galaxies (see Messier Catalogue). Principally a comet-hunter – Louis XV called him the "Comet Ferret" – Messier compiled his list of other fuzzy-looking objects so that he and others wouldn't keep confusing them for comets. Little is known about him prior to his joining the Paris Observatory as a draftsman and astronomical recorder. His interest in comets stemmed from the return of Halley's Comet, which Edmond Halley predicted would take place around the beginning of 1759. Messier sighted its return on January 12, 1759, an experience that inspired him to search for new comets for the rest of his life. (Although he is attributed with being the first person to re-sight Halley's Comet on French soil, the German amateur astronomer Palitzch is believed to have been the first of all to see it, on Christmas Day, 1758.) His final comet tally stood at 15 unique discoveries and six further co-discoveries. The compilation of his famous catalogue began in about 1760 and took more than two decades, during which time he used a variety of telescopes, including a 6-inch reflector and a 3-inch refractor.